A 7-foot clown walks into a bar. He motions for a soda water and sits there staring at his drink. The year was 1998 and Puddles had wandered into the Star Community Bar in Atlanta, GA where bartender Big Mike Geier first laid eyes on the sad, silent clown. The two soon became close friends, with Big Mike acting somewhat as a confidant as the pair travel all over with Puddles Pity Party, Mike speaking on behalf of Puddles since the clown chooses to stay silent. Originally from River City before kicking around Atlanta, the sulking serenader gained momentum after hitting the road as guest performer on the 2010 Aqua Teen Hunger Force Live tour and 2013 Eels tour and making special appearances at Seattle’s Teatro ZinZanni and NYC’s Sleep No More. It was Halloween 2013 when Puddles then teamed up with Scott Bradlee’s Postmodern Jukebox to record an epic version of Lordes’ hit song “Royals,” which instantly went viral on YouTube, having received over 16 million views so far. The “sad clown with the golden voice” captivated audiences and media from around the world, building a fan base of more than 167,000 on Facebook. 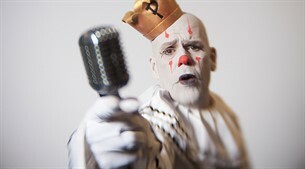 Puddles has since performed all over the planet garnering rave reviews at festivals like Edinburgh Fringe, Adelaide Fringe, Perth Fringe, Melbourne International Comedy Fest and Belgium’s Gent Fest. He was a feature performer in La Soiree’s 2014 Southbank show in London, which won the Olivier Award. In 2015, Jack Black selected Puddles to perform multiple sets at Festival Supreme, and Puddles was handpicked by Neil Patrick Harris to perform Just For Laugh’s “Circus Awesomeus” gala filmed for HBO Canada. Today, the softhearted crooner continues to wander the world with melancholic pop anthems and free hugs for all the party people. Though his suitcase is packed with plenty of Kleenex, the show is not entirely about sadness and longing. Puddles’ set is peppered with a brilliant sense of the absurd, mixing lots of humor with the awkward, tender moments. This event is part of Witching Hour, a festival in Downtown Iowa City on October 12 & 13, 2018. Presented by The Englert Theatre and Little Village Magazine, Witching Hour is a festival dedicated to exploring the unknown, discussing creative process, and presenting new work.